arm6<what>? seems to be a propped up rpi1 cpu? this can then generate python code (one of the tabs). Would it make sense to make configurations in a scratch-like way? which generate python files which do the actual loading? @luminize visualization of HAL would be awesome. The way scratch and ROS do it is visualizing basic programming constructs (turtle graphics in this case): procedural operations: top-to-bottom execution. I don't exactly know how well this fits with HAL as HAL seemed to be more like components with inputs and outputs (but I'm haven't used as many). That said, having the components be blocks that can be couples to other blocks would be really cool. 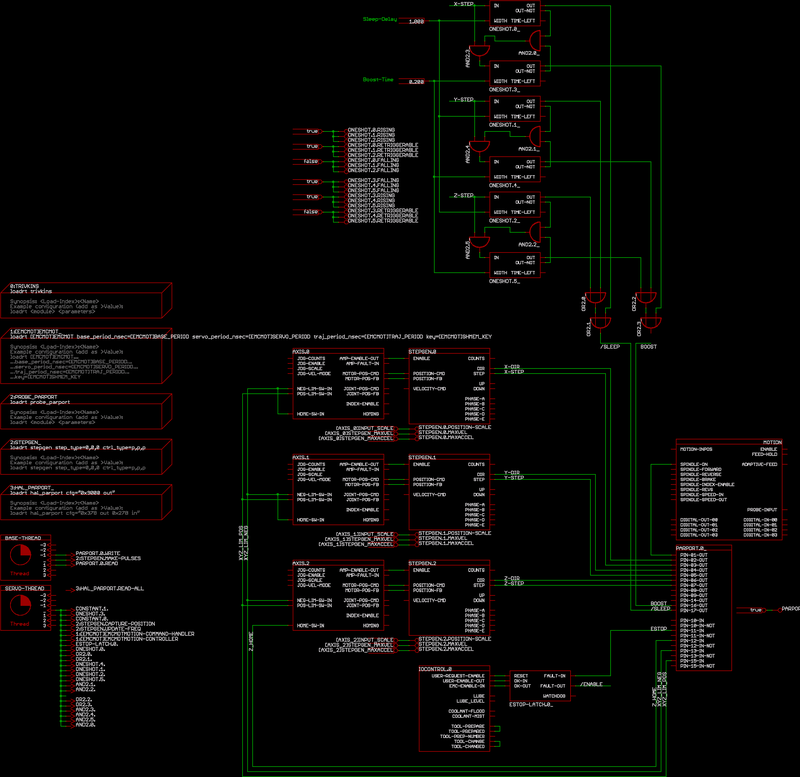 But who needs to visualise if you have a user-understandable way of making and then loading a HAL config. What is funny in this “scratch” way of configuring hal you just generate python files. I mean, if my 9 year old son can work with scratch, then somebody older can make a HAL configuration. Instead of re-inventing the wheel wrt to nifty GUIs we could re-use blockly like erle-robotics did, and start the realtime HAL. The picture above will become unreadable very quickly. Configuring is all that’s needed imo, just generating a setup of the RT part (the HAL). No programming required, and no coding errors. ok off to bed. cu later! what exactly is the problem this tool should help with? Understanding existing configs? Documenting? creating new configs? like getting succesfull quickly with something non-standard. I’m not saying we need this now, but better to know it exists if the question pops up on the list or something. ok now really off to bed. cu! imo that’s beside the point. ok, now I’m really off. feel free to bash my head while I’m asleep. I’ll read up tomorrow :) Cheers!